We were asked to remove the name of the restaurant from this German Chocolate Pie. This recipe was generously donated by Sharon Powell. This German Chocolate Pie tastes just like Marie Callendar's Pie. Take crust and cover bottom with chocolate chips, just enough for one layer to cover the bottom. Heat in oven or microwave to SLIGHTLY warm and soften the chocolate chips. Meanwhile, cook pudding according to directions on the box and add coconut and nuts, stir well. Pour while hot into pie crust. Chill in refrigerator until set. Once chilled, top with regular whipped topping (like Cool Whip). For more of a restaurant, effect put topping into a cake decorating bag with tip and pipe on. Sprinkle top with a few chocolate chips, coconut, and nuts for a finishing touch. 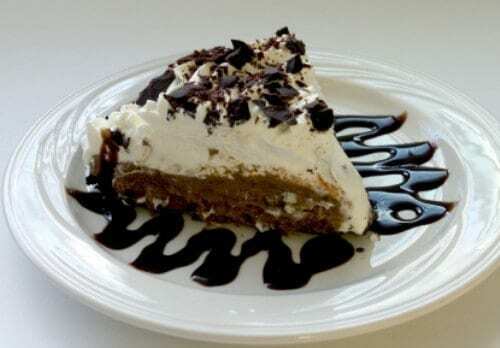 Most people preferred the German Chocolate pie with whipped cream, but if you would prefer a meringue topping... Beat egg whites, vanilla, and cream of tartar until soft peaks form. Gradually add sugar beating until stiff, glossy peaks form and sugar is dissolved. Spread over hot filling, for that Marie Calender's effect leave a smidge of filling visible around the edge, and don't forget to sprinkle the chips, coconut, and nuts on top. Bake at 350 degrees for 12-15 min or till meringue is golden. Chill in fridge.